Alex O’Neill also contributed to this feature. With a beautiful world and endearing call to adventure, Brisbane-based studio Prideful Sloth warmed many hearts this year with its debut title Yonder: The Cloud Catcher Chronicles. Doublejump was fortunate enough to sit down with the veteran developers behind Prideful Sloth and learn a bit more about them, their aspirations, and their view of the current Australian game development scene. DJ: What were some of your inspirations for making Yonder: The Cloud Catcher Chronicles and which one spoke to you the most? PS:Yonder draws on a number of well-known games offering different inspirations, from life simulations to JRPGs — however, some of the biggest influences actually came from a number of lesser known titles; games such as Infinite Space and [Final Fantasy Crystal Chronicles:] My Life as a King. These games are great examples of doing something unique and interesting whilst still feeling familiar and compelling. Hidden behind that familiarity is a great depth and brave expression of gameplay that we admire. DJ: How (and why) did you come to the decision to leave combat out of the game entirely? PS: We first talked about the mood, the tone of the game. Once we knew what sort of world [that] we wanted Yonder to take place in, we then started talking about what the player would do in the world. Through those discussions, combat never game up. It never felt like it fit into the world we wanted to create, so it was never really discussed. Our aim was to make a comfortable, familiar, and safe place to play in. As we designed, we used those terms to guide us in our decisions. DJ: Yonder has a very striking visual style. What informed the decision for the game’s visuals? PS: The visuals for Yonder are a result of trying to find a middle ground for achieving a beautiful large world that could be accomplished with our humble resources. We did a lot of initial work to define a strong art style for the game, and then [developed] a process to achieve this. The most important thing to us was focusing on the overall art direction and the impression of a scene — this meant that small detailing was unimportant in comparison. So, a more minimalist approach was developed and proven to be a big success for both the readability of the world and also the time investment [needed] to make it! We mainly focus on the mood, lighting, and overall composition of the environment in an effort to make an inviting place you want to visit. DJ: Just how important is Yonder’s story to the overall playing experience? PS: We wanted the story to help give the player grounding, however, we wanted the story to give the player room to create their own story to tell as well. It’s important to us that the player make[s] their own decisions about what they do, how they do it, and thus come away with a different story than anyone else playing Yonder. DJ: Why did you choose to use Unity to power the game? PS: Although our team has over a decade of experience using other engines professionally, we instead chose to develop Yonder with Unity based off one simple factor: rapidity of development. Yonder was always going to be something ambitious, especially given our small team size. We knew that meant [that] our time was always going to be better [spent] working on the actual game and less on system engineering. Unity has a very low overhead in this regard, and after we had developed our game’s core technologies, we were able to focus a lot of our energies on the player experience and the game itself. DJ: The pre-release “crunch” is an unfortunate reality in game development; given how small your team is, how did you try to minimise this before Yonder’s release? PS: We did our best when scoping the project to maintain sane working hours. However, we also realised at some point [that] Yonder: The Cloud Catcher Chronicles may be bigger than [what] we had expected, so in the end we put in quite a bit of extra effort, as we wanted to make a wonderful game for everyone. DJ: How have all of your previous experiences informed Prideful Sloth so far? PS: We utilised a lot of the lessons [that] we learnt on previous projects to help inform how we setup Prideful Sloth as a studio and about how we approached development on Yonder. DJ: In one word, how would you describe Australia’s game development scene and why? PS: Vibrant! Australia had so many amazing studios and games coming out of it! It’s also a very supportive community — everyone really tries to help each other out where they can. We all want to see each other succeed because we want to continue to see the industry grow! DJ: How do you see Brisbane’s scene fitting into the picture? PS: Brisbane actually has quite a number of great developers and a strong focus on PC and console games, with [Defiant Development’s] Hand of Fate series, [EarthWork Games’s] Forts, [5 Lives Studios’s] Satellite Reign, and [Witch Beam’s] Assault Android Cactus as recent releases in this space. There is also a great mobile development community locally, as well, with Prettygreat, Spunge Games, and Dan Vogt doing great work in this space. The most wonderful part is that everyone supports each other. We all truly want to see everyone succeed. It’s also wonderful that we all see each other as peers, but, even more so, we call ourselves friends! DJ: What’s next on the agenda for Prideful Sloth? 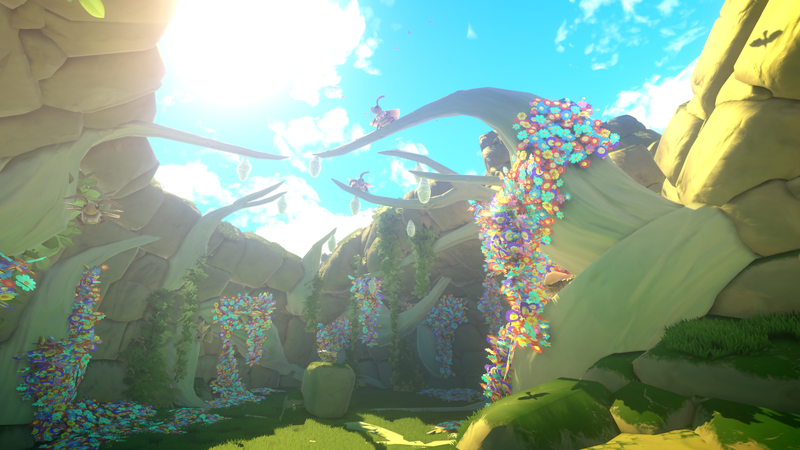 PS: We plan to continue supporting Yonder: The Cloud Catcher Chronicles for some time to come. We want to bring Yonder to more international communities by looking at launching in other countries, adding additional languages, and adding more content that will extend players’ adventures in Gemea! DJ: Finally, if you had any piece of advice for future game creators, what would it be? PS: Before you even start, know what your goal is and why you’re doing it. Is it a hobby or is it a business? What will success look like to you? What does failing mean to you? If you’re serious about making games, there’s a million questions like these that you need to be asking yourself. If you don’t know what these questions are, then you need to find someone to learn them from. The reality is that making games takes equal parts brains and heart — It’s a very cerebral activity as well as a labor of love. Failure is high, success is low. And even then it’s different from person to person, company to company. It’s exciting, terrifying, rewarding, and draining; all at the same time. Prideful Sloth’s debut release, Yonder: The Cloud Catcher Chronicles, is available now on PC and PlayStation 4. Abir is Doublejump's Managing Editor. He enjoys relaxing after a hard day’s work with a tense session of his favourite multiplayer shooter, but he is also an avid tech enthusiast, car lover, film and TV fan, budding home cook, amateur photographer, and karaoke killer.